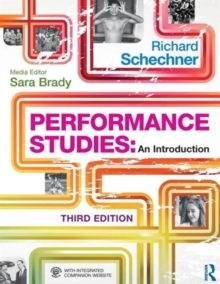 Richard Schechner is a pioneer of Performance Studies. A scholar, theatre director, editor, and playwright he is University Professor of Performance Studies at the Tisch School of the Arts at New York University and Editor of TDR: The Journal of Performance Studies. He is the author of Public Domain (1969), Environmental Theater (1973), The End of Humanism (1982), Performance Theory (2003, Routledge), Between Theater and Anthropology (1985), The Future of Ritual (1993, Routledge), and Over, Under, and Around: Essays on Performance and Culture (2004). His books have been translated into French, Spanish, Korean, Chinese, Japanese, Serbo-Croat, German, Italian, Hungarian, Bulgarian and Polish. He is the general editor of the Worlds of Performance series published by Routledge and the co-editor of the Enactments series published by Seagull Books. Sara Brady is Assistant Professor at Bronx Community College of the City University of New York (CUNY). She is author of Performance, Politics and the War on Terror (2012).